Get information to your audience immediately. Grab files from your document server, the cloud, a smartphone or tablet and print at up to 52 black-and-white pages per minute (ppm). Download the RICOH Smart Device Connector app and RICOH App for Google Cloud Print to your smartphone or tablet, and print without drivers, utilities or software. Share information instantly via multiple scan-to options and the Automatic Reversing Document Feeder (ARDF). Or, opt for paperless faxing to send and receive contracts, invoices and other forms directly from your email. Take advantage of Workstyle Innovation Technology to help you integrate multiple processes and simplify complex tasks. Choose which icons, options and features appear on your personalized user interface. Use the familiar tap, flick, pinch and swipe-scrolling motions to navigate tasks and find information faster than ever before, including online with the MFP's embedded web browser. Keep pace with growing workloads without compromising space or your budget. Place the compact MP 501SPF on your cabinet or countertop and perform everyday tasks in Mac®, Windows® and host print environments. Add up to four additional paper sources and expand your paper capacity to up to 2,600 sheets in shared-use areas with even heavier workloads. Distribute important information with unprecedented reliability. Take advantage of high-yield consumables to minimize the hassle of replenishing supplies. 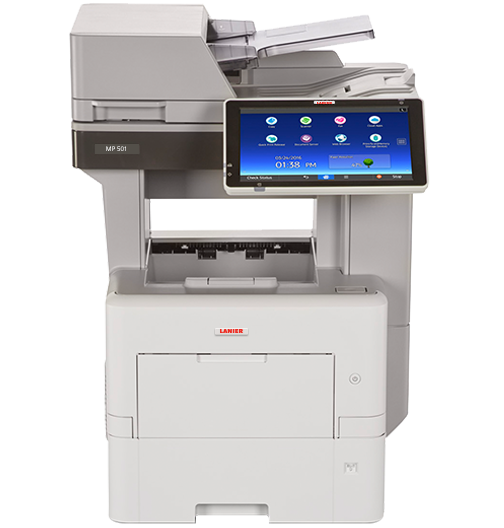 Operate the MFP almost maintenance-free to maintain optimal productivity for the life of the device. Set shortcuts to digital workflows to reduce manual steps. Download information-rich widgets or workflow apps from the Ricoh Application Site and place them directly on the Home Screen for immediate access. Use one-touch controls to access key functions, including common tasks such as ID Card Copy. The MP 501SPF is designed with a low Typical Electricity Consumption (TEC), is ENERGY STAR™ certified and meets EPEAT® Silver criteria. Plus, it includes default duplex printing to cut paper usage.